One of the nicest things about living in an appellation is that one can keep one's ear to the ground. Monteraponi is a welcome discovery; the owners, who started out by restoring a medieval hamlet in the Comune of Radda that once belonged to Count Ugo, Marquis of Tuscany, have also turned their attention to wine, with quite interesting results. Production is limited, on the order of 25,000 bottles per year, and traditional, for want of a better term. They use the classic Tuscan varietals; their Chianti Classico is made with Sangiovese and Canaiolo, and a little Colorino in the Riserva, and they also have an IGT that includes the Malvasia and Trebbiano, white varietals now banned by the Chianti Classico Disciplinare. Fermentation is in cement tanks, and they let it go as it will, with the autochthonous yeasts present on the berries, and no temperature control. The malolactic fermentation is also spontaneous, and again in cement; it is followed, for the Chianti Classico, by12 months in a mixture of 2-year old barriques from Allier and 25-hectoliter casks made from Slavonian oak, and, for the Chianti Classico Riserva, by 24 months in 25-hectoliter Slavonian and Allier oak casks. Following assembly, both wines spend 3 months in cement and three in bottle. Deep black cherry ruby with black reflections and ruby highlights. The bouquet is rich, with jammy forest berry fruit laced with some bing cherry, and supported by deft raspberry acidity. Powerfully fruit driven with slight cedar-spice underpinning that adds depth, and though there is quite a bit of alcoholic warmth, one wouldn't necessarily guess it came from one of the hottest vintages in recent memory. Nice balance. On the palate it's full, and smooth, with rich slightly sour cherry fruit supported by smooth sweet tannins that have slight savory accents, and flow into a clean smooth berry fruit finish with a tannic underpinning that provides depth without distracting. Quite pleasant, in a fairly soft key, and this is also the heat of the summer that reduced grape acidities; one could sip it by the glass, though I would be tempted to enjoy it with nicely seasoned, not too fatty grilled meats. Well made burgers, even, if you're of a mind to have a cookout. Expect it to go quickly, and you may want a second bottle. Deep black cherry ruby with black reflections and ruby highlights. The bouquet is fairly rich, with slightly balsamic berry fruit that has savory accents as well, and sandalwood spice that adds an unusual something. Intriguing. On the palate it's medium bodied, with fairly rich cherry fruit that has pleasing tart accents and flows into a clean fairly tart cherry finish; the tannins are lighter than those of the 2003, and by comparison the wine is much more acidic -- the grapes ripened more normally, and he wine has a scrappy grace to it that brings a tomboy, all knees and elbows, to mind. It's not a wine that will work well far from the table, unless you like the style, but it will contribute considerably to a meal; it will work well with red sauced pasta dishes, and will also drink quite nicely with simple grilled meats, at a cookout, say, while the acidity is such that I might also be tempted to pair it with fried meats and vegetables. In short, a versatile, pleasingly brash wine that you can expect to go quickly. Deep black cherry ruby with black reflections. The bouquet is elegant, with rich violets mingled with red berry fruit and some underlying sandalwood spice, while there are also savory accents that provide depth. Deft, and shows nice balance. On the palate it's medium bodied, with rich berry fruit supported by smooth sweet tannins that have some nutmeg and sandalwood overtones, while direction comes form clean slightly sour berry fruit acidity that flows into a deft sour berry fruit finish with tannic underpinning. It's pleasant, in a light, slightly scrappy key -- it's rounder than the 2004 -- and will drink nicely with hearty legume-based soups or dishes (fagioli all uccelletto, tomatoey beans with sausages come to mind), red sauced pasta dishes, quickly cooked meats, including heartier fare such as lamb chops. In short, a versatile food wine that will drink quickly, and you may want a second bottle. Worth seeking out. Deep black cherry ruby with black reflections and ruby rim. The bouquet is powerful, with jammy cherry fruit that has some red currant and raspberry accents, supported by slight sandalwood and hints of mentholated acidity that add depth and direction, while there is also a fair amount of alcohol -- the vintage -- and some underlying pencil shavings. Quite a bit going on, and it's nice to listen to what it has to say. On the palate it's full, with rich red berry fruit supported by smooth sweet almost chewy tannins that have some underlying warmth to them, and flow into a long clean slightly tart berry fruit finish. The first impression is that it's fairly direct, but there is considerable depth hidden under its exterior, and repeated sips reveal new facets. It is a child of the vintage, with a degree of alcoholic warmth and a softness that one won't find in other vintages, laced also with slight vegetal notes that are related (in this case) to the way grapes ripen under hot conditions, and as a result I wouldn't be too tempted to drink it far from the table. I would on the other hand eagerly break it out with a thick steak or a hearty roast, and think it would also work very well with flavorful stews, including venison and other game. It will also age nicely for at least 3-5 years, and probably more. In short, a fine expression of a difficult vintage, and one that you will much enjoy. Elegant cherry ruby with black reflections and cherry rim. The bouquet is elegant, with bright red berry fruit that gains depth from some mentholated accents and peppery spice that has hints of cumin, and underlying warmth. Considerable harmony. On the palate it's deft, and graceful, with rich red berry fruit that's supported by moderately intense smooth sweet tannins, while direction comes from vivacious slightly greenish raspberry acidity, and it all flows into a clean tart berry fruit finish with tannic underpinning. This is quick to write, but there's considerable depth and elegance in a light, decidedly traditional key; it's quite agile, and in a way brings a slender dancer to mind. It's one of those wines that can expand one's horizons, and even if you prefer more concentrated, fruit driven wines that have a considerable underpinning of oak, you will find things to appreciate and enjoy. If you're already a traditionalist, you will greatly enjoy it, and though it is a fine food wine that will contribute considerably to succulent red meats or game, you may be tempted to drink it with like-minded friends far from the table. It will hold nicely for 3-5 years, and become lacy with time. Taken as a whole, Monteraponi's wines are clearly cut from the same cloth, focusing more on finesse than power, and displaying fruity grace in a rather lacy key, while acidity, though present, complements rather than overpower. One thing I did notice in the bouquets of all the wines are faint hints of cumin, which may be derived from the autochthonous yeasts responsible for the fermentations of the wines. Bottom line: If you like the lighter, traditional-style Chianti, you will like these wines, especially the Chianti Classico Base. The Riserva is richer, with more powerful fruit, but maintains the same lightness of step. Nothing heavy or pondered here, and considering that their first vintage was 2003, I am impressed. Winding down, as I said, Monteraponi is also a hamlet, and as you might expect, in addition to making wines they run an agriturismo. It would be a nice place to spend a few days relaxing. 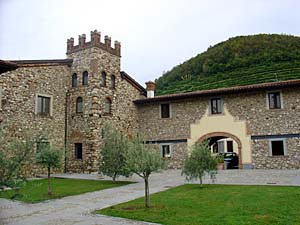 For more information about the wines, or the agriturismo, check their site. I met Alessandro Bianchi a number of years ago, when I was gathering the notes for the itinerary of Franciacorta that appeared in issue number 5 of the paper edition of the Italian Wine Review. It was the last appointment of the day and I was probably late, but he graciously stopped whatever he was doing, took me around, and then we ended up sitting in his office, sharing a bottle of bubbly, and chatting about this and that. It was a wonderful end to the end of a long but productive day. 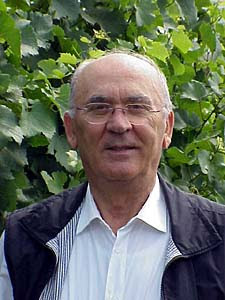 Mr. Bianchi was one of the first to think about making sparkling wines in Franciacorta: when he bought Villa in the 60s it was a crumbling farm hamlet built around a 14th century manor home, inhabited by tenant farmers who made wine (red) and had cattle as well. This was the period of the great economic boom that saw farmers abandoning agriculture for better paying jobs in the cities, and farm houses for city homes with the modern amenities that hadn't yet made it out into the country; Mr. Bianchi, who undertook the restoration of the complex as a hobby (the family owns the Officina Meccanica Fratelli Bianchi, world leaders in the production of hydraulic pumps), also decided to try his hand at making sparkling wines, and was one of the first, together with Guido Berlucchi, to visit Champagne and see how they worked their magic. 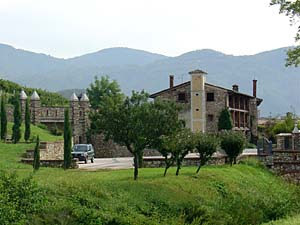 Once home, he contributed to the establishment of the Franciacorta Appellation. There was a learning curve, and it took a few years -- his first Brut was the 1977 vintage, and in 1979 he was joined by Corrado Cugnasco, the enologist who has been with him ever since. In 1986 (by which time the cattle were gone) they decided to produce a Selezione, a selection of the best to be produced only in the best years, and released only after spending 5 years on the lees. The first vintage consisted of 595 bottles to which they affixed a sticker that says "Selezione" on it; there was no 1987, and the 1988 got a new gold label. In all there have been 9 vintages of the Selezione, with the 1993 being made in Jeroboams to celebrate the arrival of the new Millenniums. The next vintage will be released in 2010. Composition? Initially the Selezione was a 60-40 blend of Chardonnay and Pinot Bianco; in adjusting it they reduced the Pinot Bianco, and, in the period up until 1994, added Pinot Nero to increase structure and elegance. Since then, the composition has been pretty much constant, if one takes year-to-year vintage-dictated variations into account. Elegant brassy gold with an abundance of foam that rises up and then settles into fine perlage (high foam is indicative of long aging on the lees). Rich bouquet with hints of tropical fruit and clover honey mingling with breadcrumbs and chalky minerality and hints of gunflint, and slight savory accents. Great depth. On the palate it's rich, and enveloping, with pleasing minerality and slight bitterness supported by sparkle and deft acidity. Great depth and elegance, and though it is soft it has great backbone as well. Quite impressive, and will drink well with a wide variety of foods, from creamy risotto (with Truffles, even), though fish and white meats. Assuming you don't decided to enjoy it with friends far from the table. It has a great lot to say and new things emerge with every sip. It will also age quite nicely. By comparison with the 2000 it is tighter, and a bit less opulent. Delicate brassy gold with lively foam that bubbles up and settles into fine constant perlage. Rich bouquet, a touch riper than the 2001, with cloverleaf honey and wet bread crumbs mingled with savory accents and slight gunflint; the overall impression is quite airy and refreshing with considerable depth. On the palate it's full and rich, with ample enveloping citrus fruit laced with minerality, and considerable mineral citrus body supported by the sparkle; it's very fresh and quite elegant, and is more enveloping than the 2001, and this is the vintage making its contribution. Very nice, and one of those wines that will capture one's attention, rather like a Beethoven piano sonata might -- you suddenly realize you have stopped doing whatever and are just listening to the music. With respect to the earlier vintages, it displays terrific finesse, and is technically superior to them. Whether it gives the same feelings is another matter, and depends upon personal taste. Deeper brassy gold with perlage that foams up, and then settles into a fine stream of bubbles. The bouquet is fairly rich, with greenish accents and some wet breadcrumbs supported by sour green apple and some hints of wet leather that are age-related, coupled with slightly oxidized scents reminiscent of a cidermill.. On the palate it's ample and soft, with fairly deft acidity supported by clean sparkle and some bitter apple accents that bring cider to mind. It has held quite nicely, and is graceful, but is at its peak -- Mr. C says the vintage wasn't the best, and it has done as well as one can expect it to do; he is right, and it still does have a story to tell. Mr. C says the fermentation temperatures were regulated, but only so much, because they were working in the old cellars. The weakest by far. A Jeroboam prepared to greet the year 2000.Lively greenish gold with lively foam that bubbles up and fades into fine persistent perlage. The bouquet is rich, with crisp green apple supported by breadcrumbs and gunflint with underlying hints of sea salt and spice. Very fresh, and most impressive (the cool 1993 fall helped to produce the freshness); its richness is also due to the format of the bottle. On the palate it's delightful, with rich citrus-laced mineral structure supported by acidity and sparkle that flow into a clean deft finish with terrific mineral depth. Graceful combining backbone with lacy elegance; in a word, superb. Mr. C attributes its elegance and depth to considerable acidity that has supported the wine through its evolution. From a technical standpoint the 2000 is superior, but this provides emotions and feelings that the other cannot, at least not yet. By comparison with the 2000, it has more wood smoke and savory accents, and slightly more bitter accents. Silver label. The wine is slightly deeper brassy gold, and foams up, settling into a fine persistent perlage. The bouquet is rich, with bright slightly oxidized apple scents that bring a cidermill to mind supported by some gunflint and minerality -- perhaps whey scents too? It's obviously mature, but also graceful, and has held better than the 94. On the palate it's full and soft, with enveloping minerality supported by slight citric acidity and fresh sparkle that's quite elegant. The palate is fresher than the nose; Mr. C says the heaviness on the nose is derived from the yeasts, and that they have changed things since then. It has in any case held very well, and has a lot to say. Graceful, in a mature key. Mr. Bianchi remembers that they got hail during this vintage, adding that it damaged some of the grapes, which yield the oxidized aromas. Most impressive for a wine that's 18 years old. Lively brassy gold with a rush of foam that settles into fine perlage. The bouquet is quite fresh, very fresh for a 21-year old wine, with delicate green apple notes mingled with some cloverleaf honey, and bread crumbs supported by hints of chalk and clean gunflint. Very nice. On the palate it's full, and soft, with ample minerality supported by some savory bitterness and deft almost brambly acidity and sparkle that flow into a clean bitter apple finish. Great depth, elegance, and freshness, and if you didn't know it you'd never guess it's more than old enough to have children. A superb vintage gives fruit. 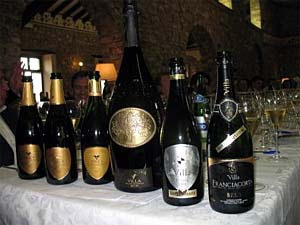 Bottom line: All the Franciacorta Selezione wines are very fresh, and invite one to drink the glass and fill another. They are also wines that will drink very well with foods, though one would perhaps do better drinking them far from the distractions of the table. They are all cut from the same cloth, and display an identity that makes them quite obviously siblings. Pale brassy yellow with perlage that foams up nicely and settles into fine steady bubbles. The bouquet is rich, with fairly intense wet breadcrumbs mingled with granitic mineral accents and some greenish overtones with underlying granny smith apples. Gives an impression of tart crispness. On the palate it's it's ample and rich, with bright bitter minerality mingled with tart apples and mineral acidity, supported by sparkle that confers both backbone and a pleasing softness. Quite elegant, and will work very well either as an aperitif or with fish or white meats served with creamy sauces -- for example, chicken with wild mushrooms. Worth seeking out, and has a great deal to say. Pale brassy yellow with fine perlage that foams up and settled into fine steady bubbles. The bouquet is rich, with bread crumbs mingled with mineral accents and gunflint. Quite elegant, graceful, and with considerable depth. On the palate it's rich, with pleasing mineral accents supported by citric notes and deft sparkle that adds fullness, and flows into a cleans savory mineral finish. Great depth, and it will work very well as either an aperitif or with foods, including delicacies such as lobster. Its major defect is that it will go all too quickly. Pale brassy yellow with perlage that bubbles up and settles into fine persistent perlage. The bouquet is fairly rich, with mineral accents and underlying bitterness mingled with breadcrumbs and more minerality. Quite elegant. On the palate it's ample and soft, with rich minerality that gains depth from mineral acidity and pleasant sparkle that provides depth, and flows into a clean bitter finish- Quite nice, and will drink well as an aperitif or with foods; it's quite approachable and though not as complex as some of Villa's other wines, is quite nice indeed. Brassy yellow with greenish highlights and perlage that foams up, and settles into a fine steady stream of bubbles. The bouquet is rich, with minerality mingled with breadcrumbs, crushed almonds, and underlying gunflint bitterness. Pleasant. On the palate it's bright, with lively crisp apple -- more the renette variety than granny smith, supported by greenish minerality that resolves into a bitter savory finish. Quite nice, with considerable depth, though it doesn't seem as dry as French pas dose wines, probably because the grapes ripen more completely than they do in Champagne, and will drink well with fish, especially crustaceans or white fish along the lines of sea bass; because of its savory accents it will also be a nice bet with creamy white meats, e.g. chicken with chantarelles. Brassy gold with brassy highlights, and perlage that bubbles up and settles into abundant fine bubbles. The bouquet is fairly rich, with green apples mingled with minerality and some acidity, with underlying gunflint and savory accents. Quite a bit going on, and it gives an impression of greater softness than the brut. On the palate it's full and soft, in keeping with the Satén style, and quite elegant, with tart apple fruit laced with minerality and some gunflint bitterness that gains direction from acidity, and is also supported by the sparkle, that flows into a clean peppery finish. Quite nice, and very approachable; it will drink nicely as an aperitif, with white meats, and also with flavorful not too fatty fish. If you like the style, or Champagne's Cremant style, it's well worth seeking out. Pale onionskin rose with perlage that bubbles up and then settles into a steady fine stream. The bouquet is mineral, with some bitter undercurrents and breadcrumbs mingled with crushed almonds. On the palate it's full, and sweet, with bright bitter almond fruit that gains depth from the sparkle, which also adds volume, and direction from moderate bitter acidity, while the Pinot that gives the color also provides backbone. By comparison with the drier wines it is softer, and this is a combination of both the sweetness and the sparkle, which is lighter than that of the bruts (rework). Pleasant, and if you like this sweeter style of Bollicine you will enjoy it. Pale brassy yellow with slight pinkish highlights. The bouquet is fairly rich, with mineral accents mingled with slight hints of mint and crisp green apple. Elegant. On the palate it's ample, with bright minerality that has pleasing bitter accents, and flows into a clean bitter mineral finish that has some gunflint overtones. Quite nice, and will drink well as an aperitif or with delicate fish. Sea bass, for example. Pale brassy yellow with greenish highlights and brassy reflections. The bouquet is clean, and bright, with minerality that brings granite to mind, and some underlying citric acidity. On the palate it's bright, with pleasant minerality that gains support from deft mineral acidity that has some bitter accents, and flows into a clean mineral finish. It's pleasant, displaying considerable harmony that makes it seem simpler than it is, and will drink well with fish or white meats. Black brick ruby with black reflections and black cherry rim. The bouquet is fairly rich, with red berry fruit mingled with bell pepper and vegetal accents with underlying savory accents. On the palate it's bright, with lively berry fruit fhtat gains depth from vegetal accents and is supported by bright acidity and smooth sweet tannins that have some vegetal accents, and flow into a clean fairly tart finish. Pleasant, in a sassy zesty key, and will drink quite well with grilled meats or light stews. Expect the bottle to go quickly, and you will likely want another. Worth seeking out. Deep pigeon blood ruby with cherry rim. The bouquet is fairly rich, with spicy red berry fruit supported by some greenish accents and pencil shavings that gain depth from considerable graphite. On the palate it's ample, smooth, and fairly sweet, with bright jammy red berry fruit supported by some greenish cedar warmth that's in part wood and in part grape, and moderate spicy acidity that flows into a clean cedar laced finish that's fairly persistent. It's an elegant expression of a hot vintage, and though there are some greenish accents one won't find in a more balanced year, it will drink nicely with rich stews or hearty roasts that are fairly fatty, for example leg of lamb. Inky pigeon blood ruby with violet rim. The bouquet is rich, and absolutely classic -- it's a Merlot in purezza -- with rich, almost chewy black currant fruit supported by slight greenish accents and underlying graphite-laced pencil shavings; the overall effect is quite ripe and very harmonious. On the palate it's full and very smooth, with rich black currant fruit that gains depth from smooth sweet tannins that are kept from being cloying by clean cedar-laced savory accents, and flow into a clean slightly bitter cedar laced berry fruit finish. Quite elegant in a very international key, and if you like the smoothness of Merlot but also enjoy some savory accents, to give it added depth and character, you will enjoy it very much. Drink it with flavorful, drier meats, for example a pot roast, roast beef cooked medium, or roasted white meats with gravy. Even if you're more traditionally minded you'll find things to think about. Last week I was lucky enough to attend a vertical of the Azienda Villa's Franciacorta Selezione Brut, working back from the present through some very interesting wines to the 1986, which was superb. To be honest, this wasn't a surprise; Alessandro Bianchi was one of the first industrialists (his family owns a company that makes hydraulic equipment) to invest in Franciacorta in the 60s: He bought what was a crumbling farm complex, with an eye towards restoring it, and then became interested in sparkling wines, and was one of the first, together with Guido Berlucchi, to visit Champagne, see how they worked, and do the same in Franciacorta. "They always made wine here," he told me when we first met a few years ago, adding that there are still wild vines in the surrounding woods. He also found traces of both the Gauls and the Romans, in particular in the layout of the buildings, though much was destroyed duri ng the centuries of skirmishing that followed the collapse of the Empire. The Venetians finally prevailed in the 1400s, bringing with them a degree of stability, and gave the complex to a mercenary Captain as payment for services rendered. The Captain quarried some of the buildings of the town for the stones he used to build his home, which has a beautiful main hall with an unusual arcade, and a grate hidden off to the side that the man (or his heirs) used to listen into the mutterings of the farmers down in the cellars. The cellars are also quite nice -- Mr. Bianchi has expanded them considerably -- and there's a section towards the back that's open to the bedrock, thick layers of hard sediments, and gives a good idea of what the vines have to struggle with to get their nourishment. Villa is more than just a winery, however. The Captain provided housing for his farmers when he built his home, and Mr. Bianchi has restored all but one of the farmer's homes beautifully; there are 15 nicely furnished apartments, space to eat outside in the shade, and a pool. 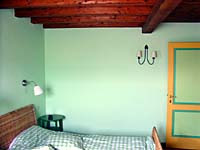 In short, Villa will be an excellent base from which to explore the region, which has quite a bit to offer, including Lake Iseo, the Val Camonica, San Piero in Lamosa, and great bird watching at the Torbiere del Sebino, while the house that Mr. Bianchi hasn't restored, with its stone sink and slightly cramped feel, provides a sobering reminder of how much things have improved in the country in Italy. More about San Piero in Lamosa.